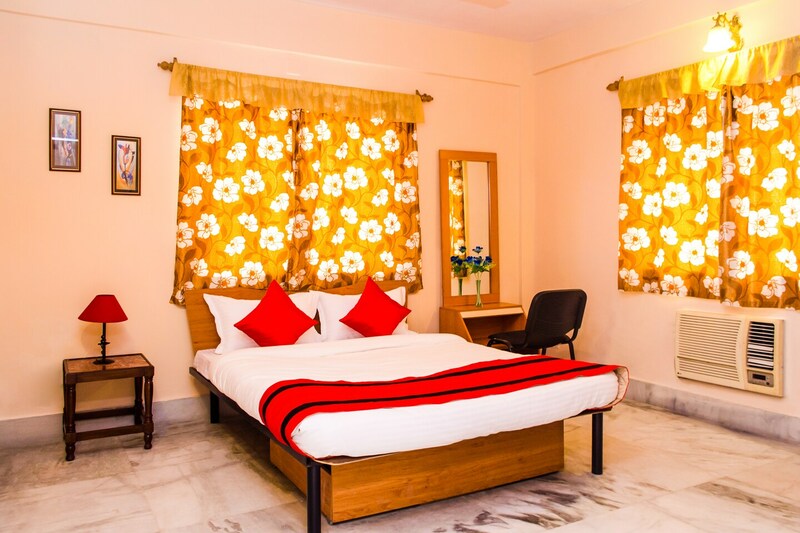 Warm appearing rooms equipped with modern amenities for a pleasurable stay. Located on Sarnalata Street, OYO 7398 near Hazra Road is a charming hotel with a simple external structure and a finely done interior. The bedrooms at the hotel have a cheery and warm decor with light colored walls, dark wood furnishings and floral curtains. Rectangular framed paintings and a floral vase give the rooms a comfortable ambience. The hotel provides its guests with free Wi-Fi and power backup so that they can stay in contact with the rest of the social world and not miss out on any important update. Other amenities offered by the hotel are a geyser, a hair dryer, laundry service and CCTV cameras. The hotel has a lot of local eateries situated nearby that serves some delicious food. While tourist spots such as James Prinsep Ghat, Rabindra Sarobar Lake, Science City More, and Statue of Mother Teresa are located close to the hotel.